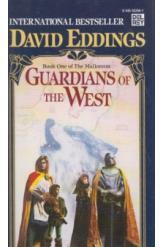 Guardians of the West Book One of The Malloreon David Eddings. The book in very good condition, all pages intact. This book is the sequel to The Belgariad. It is an epic covering strange lands and among stranger people. A fantasy of men. kings, sorcerers, and gods caught in the culmination of a 7000 year war.